Media has transgressed from its mandated role. The role of reporting and allowing the public to decide has been replaced by media taking upon itself to declare who is guilty and then going to town to use every mode of media coverage to completely tarnish and ridicule their version of the guilty party. What ensued in Aluthgama is one such instance among scores of others. Before going to print the guilty party was already decided and it was just a matter of generating the publicity to embed in the minds of the people who the guilty were. In such a scenario we must be thankful that one local newspaper (though in Sinhala medium) published a version that would never have made it to public domain. The Sunday Divaina, published on 6th July 2014 an interview by Indrajith Subasinghe, with Ven. Ayagama Samitha Thero, the chief priest who was attacked on poson poya 12th June 2014 and recounted incidents that the local English people have purposely shunned from publication. Ven. Ayagama Samith Thero took over as chief incumbent of the Kurunduwatte Sri Vijayaramadhipathi temple in Dharga Town in 2009. The temple is said to have a history of over 100 years. There were only 3 priests at the temple. The temple has over 120 dayakas who maintain the temple. Muslims live on the other side of the temple wall. The English newspapers have purposely suppressed instances that the Ven. thero had been thrown colored water by Muslim children on bikes while walking to the temple. The thero had not even informed the incident to the dayakas lest it would lead to issues. The media also blocked mention of how the other priests walking to the temple had been subject to humiliating remarks and how these priests had recounted with sadness the experience. The thero’s decision to use a threewheeler so as not to subject the other priests and thereby allow room for bigger issues is also worthy of mention but again purposely left out of public domain by the supposedly unbiased media. The cost for the threewheeler usage was borne through the sale of coconuts from 20 trees inside the temple premises which drew Rs.6000. Purposely omitted was the most important incident that took place 10 days before the events erupted in Aluthgama. Why did the English newspapers and the unbiased commentators omit to mention that a dead cow’s head and 4 dead chickens had been thrown into the temple premises? Was this act an example of peaceful co-existence and how did it tally with the peaceful slogans that are being promoted worldwide with only Buddhists declared the guilty party. The English newspapers also blocked out an incident in 2006 when Muslims destroyed the Dharmachakra at the temple premises leading to the Buddhist priests having to withdraw in fear from the temple and the temple being shut for some time. The issue of police inaction is highlighted when the thero went to the police to lodge a complaint as to who would thrown carcasses into the temple compound. Not only had the police taken away the evidence they had simply done nothing. The police have a lot to answer for. The police of the area cannot deny that over a period of time the behavior of the Muslims in and around Dharga town is what erupted into the clashes that ensued because the police and politicians were taking only one side. Removed from mention was the two policy adopted by the police with Sinhalese being charged for not wearing helmets while Muslims could ride motorcycles without. The people of the area had been silent suffers and none of these grievances have ever made headlines. We next come to the most important question. Exactly what happened in Aluthgama. No riot takes place without a reason. 12th Jun 2014 was poson poya. The Ven. thero had been returning from a bana held at the Pathirajaweela temple in a threewheeler. The road had been blocked by a threewheeler and a motorcycle and despite the thero’s driver horning 3 times the response had been Don’t make too much noise, these are our villages”. The thero had beckoned his driver to compose himself and not be intimidated. The thero’s threewheeler was not able to proceed 100metres before a motorcycle with 2 men arrived and attempted to forcibly take the thero’s driver out of the threewheeler. The 2 men were joined by another who came running towards them. The thero had descended and attempted to break the altercation when he was attacked by one person. Upon hearing that an attack was taking place the Pathirajawela temple head priest arrived and asked why a Buddhist monk was being attacked. The response given by the Muslims standing around them was whether he too wanted the same treatment. Not a single newspaper carried how the Prathirajawela chief monk was denied entry to his temple on 13th June 2014 and had to seek assistance of the STF to do so. Samitha thero was admitted to the Seenawatte hospital and from there he was taken in an ambulance to Nagoda hospital. There was no Bodu Bala Sena involvement or presence on 12th June 2014 when the thero was attacked by a Muslim man for trying to stop them harassing his threewheel driver. The thero was not a member of Bodu Bala Sena nor did he know them. Therefore, the question is for asking the threewheeler to move so that he could travel to his temple what was the crime that the chief incumbent of the Kurunduwatte Sri Vijayaramadhipathi temple in Dharga Town committed? The most important details that do not tie up to the much projected opinion that innocent Muslims were attacked are the series of incidents that have been taking place. Much of the unreported incidents if made known would certainly tip the opinion but we know that media would not do so. Please take note that the throwing of the carcasses, throwing of blue dye onto the Buddhist priests, the destruction of the Dharmachakra in the temple, the humiliations that priests walking along the road to the temple passing the mosque was subject to were all done in the absence of any involvement or presence of the BBS. These were all taking place over a period of time. The Buddhists of the area had to silently suffer because neither the police nor the politicians took the issues on the merit of attempting to ensure that people lived peacefully. These grievances numbered many and included how politicians would attend birthday parties of Muslims but not attend the funeral rites of a Buddhist priest. The unheard of grievances were many. The Buddhist priests of the temple including the chief incumbent had no history of any altercation with the Muslim community whatsoever to be subject to the abuse and humiliation that they suffered. This background information has been purposely blacked out by media. The next question is how did BBS enter the scene. Having heard what had happened to the chief incumbent and been informed by the grieving public, the BBS is said to have decided to bring the priest to the temple with the respect that had been denied to him and conduct a meeting to address the people. The meeting organized was on 14th June 2014 in the evening at the Aluthgama junction turning to Dharga town, two days after the attack on the priest. On 12th June at the police station where people had gathered to know what the police was planning to do the police had fired tear gas creating unwarranted tension. We next come to the most important question. How did the clashes ensue? After the meeting which had a gathering of close to 10,000, the people were asked to return home while the organizers would take the chief incumbent to the temple. When the people began slowly walking home a single unwarranted act led to what we are told is a Sinhala-Muslim riot. It is extremely important to note the next flurry of detail. 14th June 2014 the day the public meeting was organized was a Saturday. Why would the mosque gather 2000 people at the mosque since there was no reason to gather such a large number of people? Why would the mosque also gather huge stones kept piled to be used, the first of which had struck one of the people calmly returning home? There was no mention of who threw the first stone. For that stone was what led to putting out all the anger and humiliation that the people had been suffering. What is also noteworthy is that there was never any media highlighting the 7 Sinhala homes that had been razed to the ground or the 20 Sinhala homes destroyed there was under reporting of the Sinhalese warded at Nagoda hospital? What is interesting is that the 1915 riots began with a stone. The stone happened to have been thrown by the same parties. The Muslims threw the first stone in 1915 at a Buddhist procession no different to the 2014 incident where the first stone descended from the mosque by people who had piled up huge stones with the intent of creating an altercation. Incidentally, the 1915 riots was on a Poson poya just as the 2014 riots. If coincidences are counted further the numbers even add up to 7 for both years. There is a pattern to the denigration. All this shows that there has been a very unfair and unjust coverage of the incident and a totally unfair denigration of Buddhists. But, we understand the reasons for this too. It is well within a larger gameplan and one tied to decades of efforts to denationalize and divide the Buddhists and systematically remove the power they have that holds the country together. Sadly, ignorant Sinhala politicians for power and money have become pawns without realizing that they can and will only lead in a nation that is held together by Buddhists. If Sri Lanka ever turns into a South Korea or a Maldives (as the twin plan shows) none of the present lot of Sinhala politicians will ever find themselves eligible for even election or be elected! The general reaction as a result of biased media coverage was seen in the manner the usual culprit the Opposition Leader questioned why those attending the BBS meeting had gone through Dharga Town – with lack of knowledge of Sri Lankan landscape the Opposition Leader was not aware that anyone going to Aluthgama had to pass through Dharga town. We can recall his comment on Thoppigala! We reiterate again that Sri Lanka’s problems have erupted because of politics and in particular politicians. Likewise, the thero explicitly mentions Rajitha Senaratne as continuing to ridicule the Buddhists as he had been doing in the past. We can only question why such people are given portfolios to continue to mislead and destroy harmony while there are scores of other Ministers doing the same. The Thero in the interview does mention the names of the Transport Minister, Minister Champaka Ranawaka, Provincial Council MP Piyal Nishantha who had looked into the welfare of the Buddhists. The Thero had been presented at the meeting arranged during the arrival of the President but he had not got a chance to address his views. What the media should have taken time to highlight was how Samitha thero had spoken about the many good Muslims in Dharga town wherein one such Muslim had even visited him in hospital and apologized for the behavior of other Muslims. Media is not interested in merit or publishing good deeds and so the many acts that the thero had taken part in was again purposely left out. The media thus never said a word about how Samitha thero distributed sweatmeats during the Sinhala New Year, where he would parcel these items himself and distribute to poor Muslims homes. Media never highlighted how Samitha thero would give coconuts and jackfruits from the temple compound to poor Muslims as well. 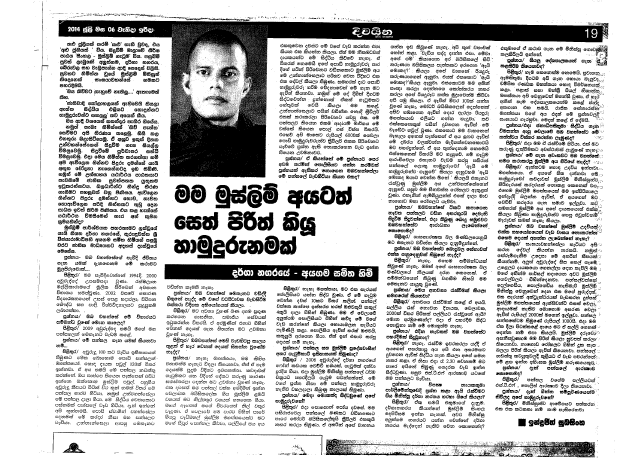 Samith thero in the interview cited an occasion where a poor Muslim operating a tractor who had met with an accident had come to him to ask Rs.2000 but the thero had only Rs.1000 and had given it saying he did not need to return the money. Why did the media purposely omit to mention how Samitha thero had chanted pirith at the Nagoda hospital to sick Muslim children or the fact that even the temple compound is being given to a poor Muslim to maintain so that he would have a livelihood. It was to such a Buddhist priest that the Muslims attacked in Dharga town. Should the people have not been given these details to decide for themselves who the guilty were? Moreover, much has been left out. There is never mention of the Muslim-Muslim rifts and how far the Sufis of Sri Lanka are being targeted by fellow Muslims via Wahhabi funded movements, groups so much so that these people are being forcibly evicted from where they lived. The media blackens out how far the Wahhabi influence is what contributes to the change in Muslim dress, manipulating Muslims in their submission to the religion to adopt Wahhabi cultures and behaviors that are not only distancing Muslims among Muslims but creating the dent in peaceful co-existence. Dr Ameer Ali, a scholar and former Advisor to the Australian Government has quite rightly asked that Muslims should first wonder whether they want to be Muslims of Sri Lanka or Muslims in Sri Lanka. He says that Muslims are self-segregating themselves calling it a ‘self-inflicted alienation’ and then blaming the Sinhala Buddhists. Dr. Ali’s advise for Muslims to indulge in self-introspection ended up in him being at the receiving end of vituperative attacks by Muslims themselves. A Muslim himself is declaring that Muslims in Sri Lanka were not intermingling. Dr. Ali also highlighted an aspect that thus far had not been openly mentioned and that was to question why Muslims did not hoist the national flag and most do not even know the national anthem. Dr. Ali was compassionate even to view the manner why cattle slaughter was being objected to, and also confirmed what we have been saying all the while that the abaya was never seen in Sri Lanka until immediately late 2000 and he confirms too that the abaya has nothing to do with Islam and it was on this argument that France secured the ban. That the politicians and corrupt municipal and provincial counsils have allowed mushrooming churches and mosques was highlighted in 58 mosques in Kattankudy some with less than 20 people attending. History has repeated. The police were bribed in 1915 to stop drumming when the Buddhist perahera was passing the mosque along the perahera route. Unwritten laws were violated by Muslims no different to the grievances that had been omitted by media. It was the Sinhalese Buddhists who were arrested by the British Government. Punishment for offence was to be death. D S Senanayake, his brother F R Senanayake, D R Wijewardena and D B Jayatilake were also arrested, falsely charged and imprisoned. Martial law was declared. It was Sir Ponnambalam Ramanathan a real statesmen who came to the rescue and travelled to England to argue the case on behalf of the Sinhalese. Sir Ponnambalam argued the case so well that not only was he able to transfer the Governor, recall the head of the British military but get all the Sinhalese released as well. The horse drawn carriage arranged in Colombo was not drawn by horses but by all the illustrious Sinhala leaders who carried Sir Ponnambalam to his residence to show their appreciation. We wonder whether Sri Lanka will ever have such leaders. The cause of the 1915 riots was the inept handling of sensitive issues ignoring the sensitivities of the Buddhists in a Buddhist civilization that they had built and have been throughout claiming acknowledgement of. The 2014 incident has been a sad repetition. The media has much to account for the mischief that ensues in Sri Lanka. Now, who is responsible for governing the country properly after 26640 children gave lives to achieve peace ? Did they die to allow set up an “eelaam council” or evict Samith Thero from “Darga Town” ? Why there is a Darga Town” in the first place ? Not only Sir Lanka media but also the only “free media” shy away from blaming the present leadership ? Until this root of the problem is solved, country will be going to THE DOG. This should be given the WIDEST COVERAGE. Blood drenched Darisha Bastians, the Arabic sub editor of Sunday Times, Shoora Terror Council, Chandraprema and other BIASED REPORTERS have whitewashed the real terrorists and demonized the real victims. How did the riots END? When 3 Jihad terrorists were shot DEAD the riots ended. When VP was shot dead the war ended! It is OBVIOUS who the terrorists and rioters were. Glad they are all dead. Thanks very much Shenali for this exposé, basically an admirable consolidation of indisputable, stark facts that were known in fragmented form to many of us, before and after this so called riot. Clearly it appears that the Sri Lanka Police in this area were under the influence of of a small Muslim extremist group also residing in the area and member of that group were having a gala time, long time before this incident, harassing and insulting not only Ven. Ayagama Samith Thero of that area, but also Buddhism itself. This is not the first time that SL Police have taken the side of such racist-communalist-extremists. If we recall, even during the days of LTTE terrorists, there was really not a dire shortage of corrupt SL Police parasites who were willing to do the bidding of the LTTE – all for hefty sums of money. What boggles my mind is how come all this went on, for this long, and no righteous “honcho” in our national security/defense establishment caught on to this toxic-rot and ruthlessly stamped it out? Defense Secretary Gotabaya Rajapakse: Was not the horrific racist-communalist LTTE terrorism a good lesson for all of us, for another 100 years? How could you leave room for another bloodbath along the same line, with colossal destruction of our nation? Extremely good point by Lorenzo. Why is this fact is not even published properly ? Because the stupid government is siding the Jihadists. Great to see you at work here. Regarding corrupt police being bought with Jihadist/Wahabbi money, we have to remember that Sri Lanka’s entire National Budget is mere pocket money for the nations that harbour and sponsor them. The recent fiasco they wrought recently in the Middle East should serve as a clear warning. The US, driven by Billary Clinton’s confused “human rights” and “democrazy” dogma … supported a “rebellion” by “democratic forces” in Syria, working hand-in-glove with a wink and a nod with Saudi Arabia, Quatar and the UAE, to fund and arm the “freedom-loving” Syrian rebels, hoping to overturn the Syrian ally of Iran … which was their ultimate target. But, as they say, the best laid plans of mice and men often go seriously astray. Instead, these Wahabis funneled money to the Al-Quaida affiliated jihadists of all stripes, who completely dominated and drove out the US supported rebels. So much Wahabbi money flooded into Syria that not only did it undermine the so-called “democratic” rebels but also gave rise to a Jihadist group (ISIL) that is even more extreme than Al-Quaida. The ISIL (the Islamic State of Iraq and the Levant) has now been transformed into a military juggernaut calling itself the Islamic State. Recently it declared itself a Caliphate with pretensions to the allegiance of ALL MUSLIMS worldwide. Not only have the US supported “democratic” rebels been thoroughly subjugated, but the Islamic State has rolled in to Iraq sweeping all before them, and combining vast tracts of both Syria and Iraq into a single proto-Caliphate. You can imagine the consternation of the US that now sees all of its Herculean efforts, and sacrifice of blood, tears and treasure, in the Middle East going down the proverbial tubes. The growth of this “Islamic State” that repudiates all national boundaries drawn by colonial powers in the past, now threatens Jordan, and all of those nations who funded them: Saudi Arabia, Quatar and the UAE, among others. In the meantime, the US has lost all appetite for involvement in more land wars in the Middle East, and can only watch in absolute horror! Indeed, the best laid plans of mice and men do often go seriously astray. Sri Lanka has to beware of the flood of Wahabbi money that can be unleashed against it in the future. That can only be prevented, by taking all those steps necessary now to monitor, control and prevent the inflow of such monies, and to control and prevent the transformation of Sri Lanka’s moderate Sufi Moslem community into the fanatical Wahhabi form following the “execute the prisoners” dictum. unbiased commentators omit to mention that a dead cow’s head and 4 dead chickens had been thrown into the temple premises? If this above incident has been done by Muslim than a Lankan Tamil I have to accepted what you have done to them ( 3 shot DEAD ) fine. Shenali: Thank you again for a very “investigative” report on Aluthgama. The “Sinhala Buddhist Elite Expatriate Eminent Persons” who gathered to discuss this incident in Canada and issued a “Statement” through this page MUST read this “Ball by Ball” commentary to educate themselves of what is going on in this country. As Shenali very correctly stated here the “English Media” catered to their “readership” and that is what got circulated all over the world. In the absence of a “balanced” media coverage of news, it is natural and cultural for the people to gather and make “Gossip Sessions” that are being used extensively to work on different “agendas”. One wonders whether that is what is called “Media Freedom”. There is also one “MARTYR” Minister of the Government from the area, who reportedly said “I am waiting till the BBS come to my home”. Also it is “hilarious” to hear “Mr. Thoppigala” giving us the “Geography/Military Sithiyama” of the Aluthgama fracas. It was Sir Ponnambalam Ramanathan a real statesmen who came to the rescue and travelled to England to argue the case on behalf of the Sinhalese. Sir Ponnambalam argued the case so well that not only was he able to transfer the Governor, recall the head of the British military but get all the Sinhalese released as well. The horse drawn carriage arranged in Colombo was not drawn by horses but by all the illustrious Sinhala leaders who carried Sir Ponnambalam to his residence to show their appreciation. We wonder whether Sri Lanka will ever have such leaders.! Another excellent article by Shenali. I’m convinced that much of the Sri Lankan media. Certainly the English language part of the Sri Lankan media has their loyalties to a foreign power and not to the Sinhalese Buddhist community who comprise the majority of Sri Lanka. Whose views should be what should be mainly represented in the mostly English language part of the Sri Lankan media. It would be interesting to do a background research check on all the individuals such as editors and writes and owners of the English language part of the Sri Lankan media and some of the Sinhalese language part too. I bet they would be having some connection to foriigne intelligence networks in the west. The solution to this is at hand with the availability of the power of the internet to more and more Sri Lankans in Sri Lanka. The Sinhalese Buddhist community can start their own media organisations to put out the majority view of the Sri Lankan population on events. However the drawback is that we must keep in mind that the nefarious centres such as the NSA and GCHQ spy not just in their own countries but spy on citizens in the whole world and the whole internet as the revelations stunned people even like Dilma Roussef the Brazilian president. When it came out that NSA and GCHQ were spying on citizens in their country. Also Sri Lankans should be aware that British Govt is trying to make it legal to spy on people on the internet using their facility GCHQ in the UK. Which could be used by the British Govt to spy on people in Sri Lanka who would voice opposition to English language Sri Lankan media pieces. Something to be aware of. Google: British Politicians In ‘Secret Deal’ To Allow Mass Surveillance Of Public. UK political leaders of conspiring to allow spooks to continue to conduct mass surveillance on the public by collecting records of phone calls, text messages and internet usage without a legal basis. It doesn’t stop there if they could they would spy on Sri Lankan citizens via the internet on Sri Lanka.” quote from an internet article. “The British government claims it needs to record every phone call and log every text message and email because of terrorism. The Prime Minister David Cameron today said that MI5 and police should immediately be given the legal power to do so in order to stop terrorist plots, citing recent “events in Iraq and Syria” as justification.” quote from an internet article. It doesn’t stop there if they could they would spy on Sri Lankan citizens via the internet on Sri Lanka. However Sinhalese Sri Lankans should mobilise and use the internet to create their own media outlets and circumnavigate the biased English language newspapers and organisations. If so then why did this not lead to an immediate protest organized by the Buddhist Sanga on all the cities of Sri Lanka? If a head of pig was tossed into a Mosque in a predominantly Muslim nation by a minority Buddhist community the Muslims would not only take to the streets the Buddhist minority would have immediately been attacked including their Temples. Why did the Buddhist priests not take action for 10 FULL DAYS???????? WHY DID THEY WAIT? BY THEIR LACK OF IMMEDIATE ACTION THE BURDEN OF PROOF THEN FALLS ON THE DELAYED ACTION BY THE BUDDHISTS AGAINST THE MUSLIMS. UNTIL I READ THIS ARTICLE I NEVER HEARD OF THIS TERRIBLE ACTION. WHY WAS IT DELAYED IN REPORTING THE NEWS AND WHY DID THE BUDDHIST SANGA NOT TAKE IMMEDIATE ACTION IF THE POLICE DID NOT? I posted couple of Utube clips which indicated this incident under comments section of prof. Hudson Mcleans unjustifiable writing. With great difficulty I found the truth because Jihadists have flooded Utube with rubbish. This is the problem. It is very difficult to find the truth because Allah block it. WHY WAS IT DELAYED IN REPORTING THE NEWS AND WHY DID THE BUDDHIST SANGA NOT TAKE IMMEDIATE ACTION IF THE POLICE DID NOT? Because the Government was scared. Even government media did not publish until Champika came forward as the only truth teller. If we pay gratitude to MR we must worship Champika. So called Sinhala Muslims “riots” ended in VICTORY to SL and DEFEAT to Jihad. Attacks on the Buddhist temple stopped AFTER the riot. Muslims throwing cow heads to the Buddhist temple stopped AFTER the riot. 3 JIHAD terrorists terrorizing the area were killed by the STF during the riot. Blocking the road by JIHAD terrorists stopped AFTER the riot. Now Muslims in Dharga town WORSHIP the Buddhist monk and call him “APE AMUTHURUWO” (OUR Buddhist monk!!!). All thanks to the “riot”. VERY GOOD to AOID riots and achieve these things peacefully but when JIHADISTS and Tamil terrorists block that avenue there is no other way. All in all the riot was a GOOD THING than having to PUT UP WITH JIAD INTIMIDATION IN SILENCE. Unfortunately Tamil terrorists and JIHAD terrorists ONLY understand the language of violence. You have to talk to them in that language. Until then they won’t understand. This entry was posted on Thursday, July 10th, 2014. You can follow any responses to this entry through the RSS 2.0 feed. You can skip to the end and leave a response.